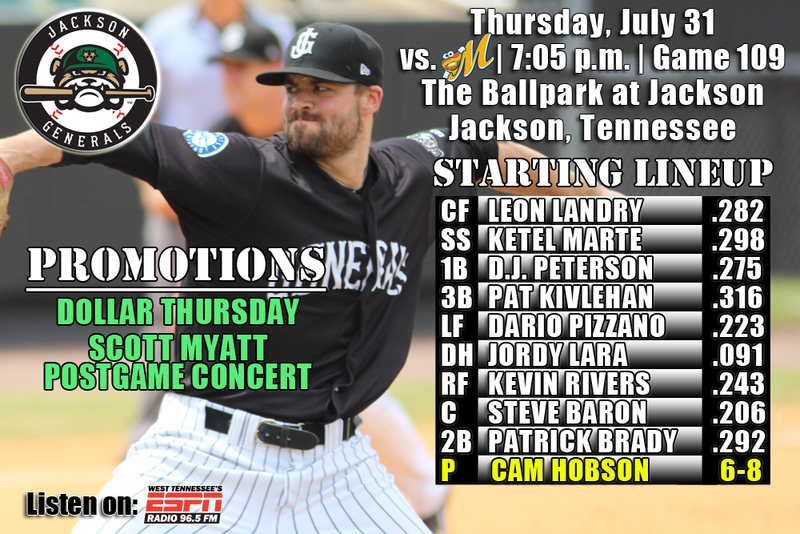 • On Thursday, the Generals open a 5-game series with Montgomery at The Ballpark at Jackson (0-0)…the Generals are 4-6 against the Biscuits this season and 2-3 in Jackson…the Generals have won 3 of the last 5 series and won 4 of 5 in last homestand vs. Huntsville…dropped 4 of 5 on recent road trip to Mobile. • RF Patrick Kivlehan hit a 2-run home run in the 6th inning, but the Generals could not overcome a 7-run 3rd inning as Jackson fell to Mobile 7-3 on Wednesday night. • Kivlehan (1×3, 2 R, HR, 2 RBI, BB), SS Ketel Marte (1×4, R), LF Dario Pizzano (1×3, BB), DH Jordy Lara (1×4, 2B) and 1B Dan Paolini (1×2, BB) each recorded 1 of the team’s 5 hits. • Starter Tyler Pike (2.2,7,7,7,2,4) recorded his 2nd loss with Jackson after allowing 7 runs in the 3rd inning. RH Trevor Miller (3.1,4,0,0,1,3) and RH Matt Brazis (2.0,1,0,0,0,2) combined to hold the BayBears scoreless over the final 5.1 innings in relief. • Over the last 9 games, Jackson’s starting rotation has a 3.80 ERA (19ER/45IP) and have issued 5 quality starts over that time. • Victor Sanchez is 2-0 with a 2.02 ERA (8 ER, 35.2 IP) in 6 starts in July. Duing this stretch he has limited opponents to a .198 (25×126) average, while walking 9 and striking out 28. 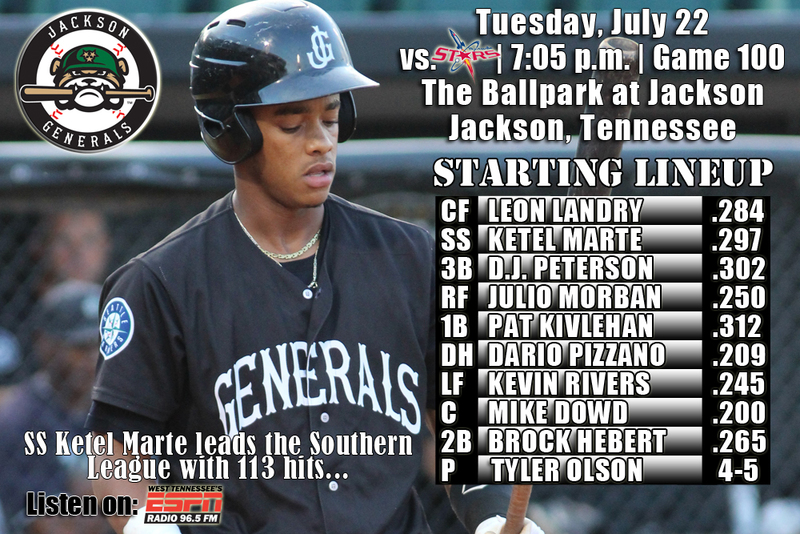 • The Generals picked up their 14th win of July Monday night in Mobile. Jackson won 13 games in April and 12 games in June. This month Jackson is batting .275 (T-1st in SL) with 19 home runs and the pitching staff has a 3.82 ERA. • INF/OF Patrick Kivlehan currently ranks 3rd in the Southern League in batting (.316) and 4th in slugging percentage (.519). Kivlehan also ranks 7th in the M’s organization in average (.307), T-4th in HR (17) and 2nd in RBI (88). Those numbers combined between Jackson and High Desert. • Kivlehan has a .373 (25×67) average with RISP with 5 doubles, 2 triples, 2 home runs and 39 RBI and a .460 OBP. He is also batting .500 (3×6) with the bases loaded and 6 RBI. • Bring on the Biscuits – The Generals are 4-6 this season against Montgomery and 2-3 in Jackson…the Generals are batting .284 with 6 home runs, 23 doubles, 4 triples and 54 runs scored in 10 games. • The pitching staff has a 4.69 ERA, surrendering 12 home runs and 54 total runs in the 10 games played. • Relieving Guaipe – RHP Mayckol Gaipe picked up his team-leading 8th save Monday and has a 2.42 ERA in 29 games this season, with 42 strikeouts… ranks 3rd among SL relievers having just walked 8 batters in 44.2 IP…he also ranks 2nd in fewest baserunners/9IP ratio at 8.26 (41/44.2 IP). • Landry is the toughest in the league to strikeout – OF Leon Landry leads the Southern League in fewest strikeouts, fanning just once in every 9.15 at-bats. • Summer of Hitting – The Generals are leading the Southern League in batting since June 1st, batting .281 (491/1,745) with 30 home runs, 102 doubles and 24 triples in 52 games. • July Is Pizza Time – OF Dario Pizzano leads the club batting .329 (24×73) in the month of July with 12 runs, 5 doubles, 4 triples, 2 home runs, 17 RBI’s and a .452 OBP. • Miller Time – Since being moved to the bullpen on June 22, RHP Trevor Miller has a 2-1 record, with a 2.08 ERA (7ER/30.1IP) in 11 games, striking out 31 and walking 11. • INF Patrick Kivlehan has hit safely in 13 of his last 14 games, batting .370 (20×54) with 9 runs scored, 6 doubles, 3 triples, 2 home runs, 13 RBI and 6 walks. He also has hit safely in 18 of his last 20 games, batting .378 (28×74) with 15 runs scored, 7 doubles, 4 triples, 3 home runs, 18 RBI and 8 walks. • On Wednesday, the Generals play the series finale at Mobile (1-3) and the final game between the clubs in 2014 (5-14)…the Generals have won 3 of the last 5 series and won 4 of 5 in last homestand vs. Huntsville. • The Generals scored a run in the top of the 5th inning to take a 1-0 lead, but it wasn’t enough as Jackson fell to Mobile 2-1 on Tuesday night. • CF Leon Landry (2×5, 2B, BB) led the team with 2 hits, while 1B/3B Patrick Kivlehan (1×4, 2B, BB), LF Dario Pizzano (1×4, BB), 2B Patrick Brady 91×5), C Mike Dowd (1×5) nad 3B/SS Brock Hevert (1×4, R) each recorded 1 of the team’s 7 hits. • Starter Victor Sanchez (6.2,6,1,1,1,5,HR) allowed 1 run on 6 hits in 6.2 innings, but did not factor into the decision. LH Kyle Hunter (1.1,1,0,0,0,0) allowed 1 hit in 1.1 innings, while RH Moises Hernandez (2.1,2,1,1,1,0,HR) allowed a solo home run with 1 out in the bottom of the 11th inning to pick up his 5th loss of the season. • INF Patrick Kivlehan is batting .373 (25×67) with runners in scoring position this season with 5 doubles, 2 triples, 2 home runs, 39 RBI and 14 walks, posting a .476 OBP. Kivlehan continues to hit on the road – He now has a league-best 33-game road on-base streak which dates back to May 22 and is the longest by 10 games this season in the SL. During that time he is batting .344 (43×125) with 17 runs, 9 doubles, 3 triples, 4 home runs and 29 RBI during that time and a .410 OBP. 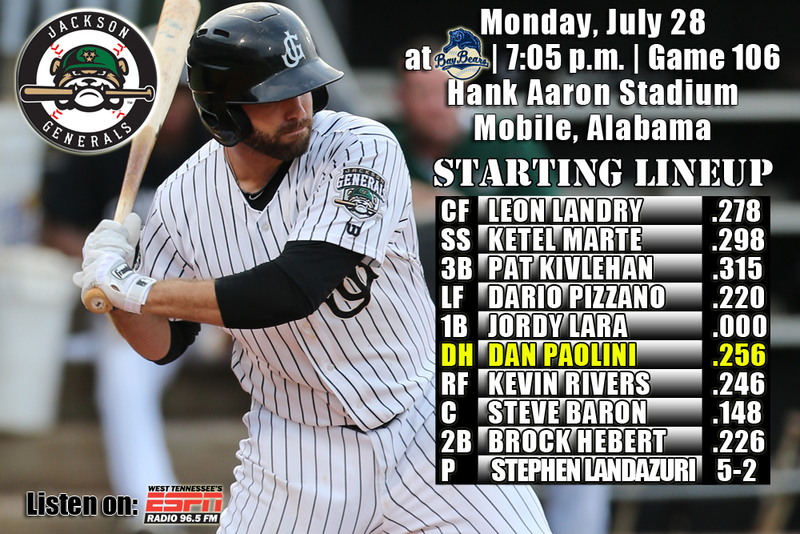 • The Mobile Mega Bowl – Jackson is 15-28 in games played at Hank Aaron Stadium in Mobile since 2011…the Generals have dropped 6 straight series and the last series win was May 25-29, 2011, taking 4 of 7 in a series that included 2 doubleheaders…this is the 3rd and final trip to Mobile this season for Jackson. • July Is Pizza Time – OF Dario Pizzano leads the club batting .329 (23×70) in the month of July with 12 runs, 5 doubles, 4 triples, 2 home runs, 17 RBI’s and a .449 OBP. • Miller Time – Since being moved to the bullpen on June 22, RHP Trevor Miller has a 2-1 record, with a 2.33 ERA in 10 games, striking out 28 and walking 10 in 27.0 innings. • 3B D.J. Peterson has reached base safely in 18 of his last 19 games (hits in 14 G) with 8 multi-hit contests, batting .315 (23×73) with 14 runs scored, 4 doubles, 5 home runs, 9 walks and 1 stolen base. Peterson has recorded at least 1 hit in 21 of 27 games with Jackson, while reaching base safely via a walk or hit in 25 games. Overall with Jackson he is batting .286 (30×105) with 15 runs scored, 6 doubles, 5 home runs, 16 RBI, 11 walks and 1 stolen base. Peterson leads all Mariners farmhands with 23 home runs. • INF Patrick Kivlehan has hit safely in 12 of his last 13 games, batting .373 (19×51) with 7 runs scored, 6 doubles, 3 triples, 1 home run, 11 RBI and 5 walks. He also has hit safely in 17 of his last 19 games, batting .380 (27×71) with 13 runs scored, 7 doubles, 4 triples, 2 home runs, 16 RBI and 7 walks. Starter Victor Sanchez is 2-0 with a 2.02 ERA (8 ER, 35.2 IP) in 6 starts in July. Duing this stretch he has limited opponents to a .198 (25×126) average, while walking 9 and striking out 28. 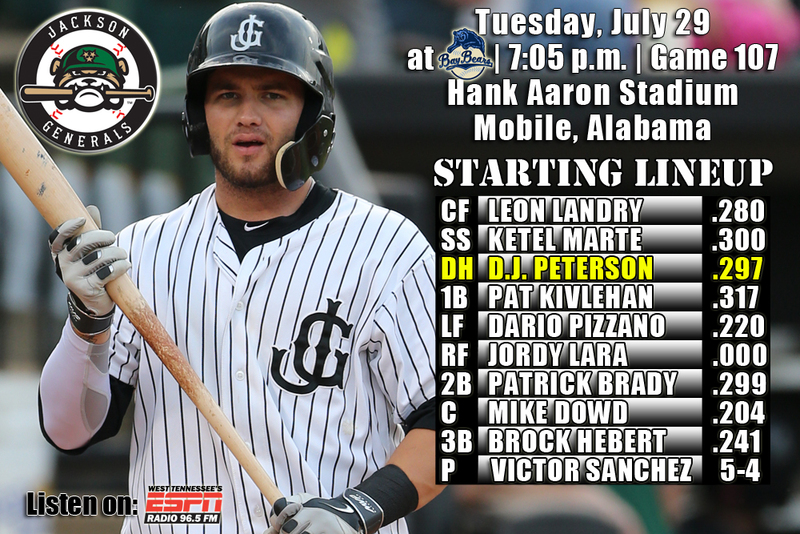 • On Tuesday, the Generals play game 4 of a 5-game series at Mobile (1-2)…the Generals have won 3 of the last 4 series and won 4 of 5 in last series vs. Huntsville at home…this is Jackson’s 3rd trip to Mobile and are 4-9 at Mobile this season and 5-13 overall. • The Generals scored 3 runs in the 4th inning, 4 runs in the 6th inning and 1 run in the 8th as Jackson defeated Mobile 8-4 on Monday night. • C Steve Baron (3×4, R, RBI, BB) led the team with 3 hits, while 2B Brock Hebert (2×5, R, 2B, 3 RBI) drove in a team-high 3 runs. CF Leon Landry (2×5, 2 R, 3B, RBI, SB) and 3B Patrick Kivlehan (2×5) each recorded 2 of the Generals 12 hits. 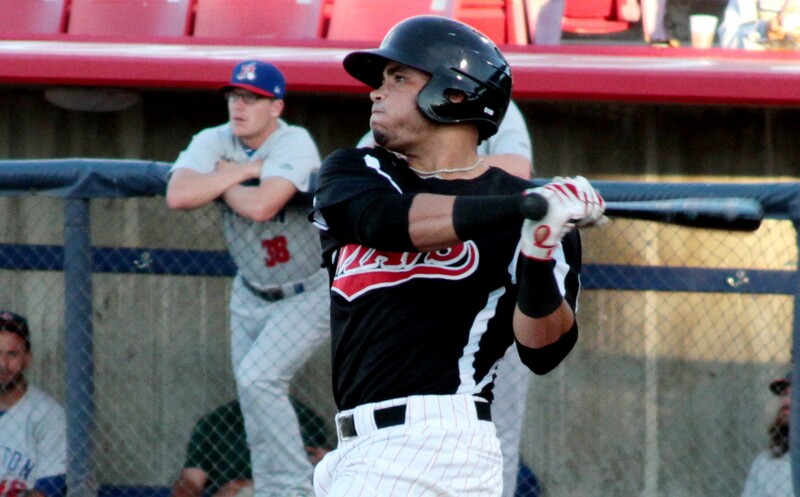 1B Jordy Lara (0x2, R, 3 BB) scored 1 run and walked 3 times in his AA debut. • Starter Stephen Landazuri (6.0,2,2,2,4,3) allowed 3 runs on 2 hits in 6.0 innings to earn his 6th win of the season. RH Richard Vargas (0.2,2,1,1,2,2), RH Stephen Shackleford (1.0,1,0,0,1,1) and RH Mayckol Guaipe (1.1,1,1,1,0,1) combined to allow 2 runs over the final 3.0 innings in relief. Guaipe recorded his 8th save of the season. • The Mobile Mega Bowl – Jackson is 15-27 in games played at Hank Aaron Stadium in Mobile since 2011…the Generals have dropped 5 straight series and the last series win was May 25-29, 2011, taking 4 of 7 in a series that included 2 doubleheaders…this is the 3rd and final trip to Mobile this season for Jackson. • Summer of Hitting – The Generals are leading the Southern League in batting since June 1st, batting .284 (484/1,705) with 30 home runs, 100 doubles and 24 triples in 51 games. • July Is Pizza Time – OF Dario Pizzano leads the club batting .333 (22×66) in the month of July with 12 runs, 5 doubles, 4 triples, 2 home runs, 17 RBI’s and a .452 OBP. • INF Patrick Kivlehan has hit safely in 11 of his last 12 games, batting .384 (18×47) with 7 runs scored, 5 doubles, 3 triples, 1 home run, 11 RBI and 4 walks. He also has hit safely in 16 of his last 18 games, batting .388 (26×67) with 13 runs scored, 6 doubles, 4 triples, 2 home runs, 16 RBI and 6 walks. • Starter Victor Sanchez is 2-0 with a 1.86 ERA (6 ER, 29.0 IP) in 5 starts in July. Duing this stretch he has limited opponents to a .178 (18×101) average, while walking 8 and striking out 23. • INF Patrick Kivlehan is batting .379 (25×66) with runners in scoring position this season with 5 doubles, 2 triples, 2 home runs, 39 RBI and 14 walks, posting a .476 OBP. Kivlehan continues to hit on the road – He now has a league-best 32-game road on-base streak which dates back to May 22 and is the longest by 10 games this season in the SL. During that time he is batting .347 (42×121) with 17 runs, 8 doubles, 3 triples, 4 home runs and 29 RBI during that time and a .410 OBP. • OF Julio Morban was promoted to AAA Tacoma Sunday and OF Jordy Lara was added from A+ High Desert. Lara leaves the California League winning back-to-back Hitter of the Week awards and ranks 1st in hits (141), 2nd in batting average (.353), 2nd in RBI’s (80), T-6th in doubles (26), T-3rd in home runs (22), T-3rd in runs scored (77) and 3rd in slugging percentage (.609). • On Monday, the Generals play game 3 of a 5-game series at Mobile (0-2)…the Generals have won 3 of the last 4 series and won 4 of 5 in last series vs. Huntsville…this is Jackson’s 3rd trip to Mobile and are 3-9 at Mobile this season and 4-13 overall. 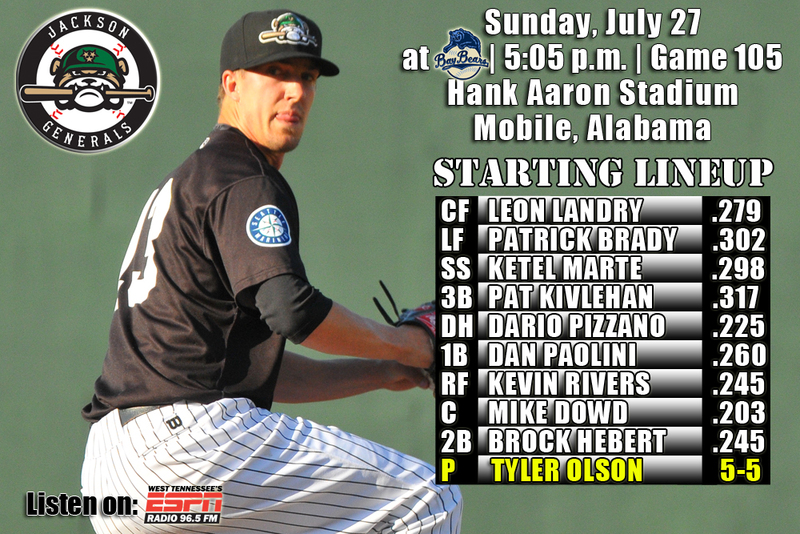 • The Generals trimmed a 3-0 deficit to 3-2 in the 6th, but got no closer on Sunday in a second straight loss at Mobile. • Leon Landry (1×5, R) and Ketel Marte (1×3, RBI) added a double each, while Marte and Patrick Kivlehan (0x2, RBI) collected the teams only RBI’s. • Starter Tyler Olson (5.1,7,3,0,1,5) allowed just 3 unearned runs and reliever Trevor Miller (2.2,1,0,0,0,2) tossed his second straight scoreless relief outing. • INF Patrick Kivlehan is batting .391 (25×64) with runners in scoring position this season with 5 doubles, 2 triples, 2 home runs, 39 RBI and 14 walks, posting a .476 OBP. Kivlehan continues to hit on the road – He now has a 31-game road on-base streak which dates back to May 22 and is the longest by 10 games this season in the SL. During that time he is batting .345 (40×116) with 17 runs, 8 doubles, 3 triples, 4 home runs and 29 RBI during that time. • The Mobile Mega Bowl – Jackson is 14-27 in games played at Hank Aaron Stadium in Mobile since 2011 and have dropped…the Generals have dropped 5 straight series and the last series win was May 25-29, 2011, taking 4 of 7 in a series that included 2 doubleheaders…this is the 3rd and final trip to Mobile this season for Jackson. • Summer of Hitting – The Generals are leading the Southern League in batting since June 1st, batting .283 (472/1,667) with 30 home runs, 98 doubles and 23 triples in 50 games. • Pizza Time – OF Dario Pizzano leads the club batting .339 (21×62) in the month of July with 12 runs, 5 doubles, 4 doubles, 2 home runs, 16 RBI’s and a .456 OBP. • 3B D.J. Peterson has reached base safely in 17 of his last 18 games (hits in 14 G) with 8 multi-hit contests, batting .333 (23×69) with 14 runs scored, 4 doubles, 5 home runs, 8 walks and 1 stolen base. Peterson has recorded at least 1 hit in 21 of 26 games with Jackson, while reaching base safely via a walk or hit in 24 games. Overall with Jackson he is batting .297 (30×101) with 15 runs scored, 6 doubles, 5 home runs, 16 RBI, 10 walks and 1 stolen base. • INF Patrick Kivlehan has has hit in 10 of his last 11 games, batting .381 (16×42) with 7 runs scored, 5 doubles, 3 triples, 1 home run, 11 RBI and 4 walks. He also has hit safely in 15 of his last 17 games, batting .387 (24×62) with 13 runs scored, 6 doubles, 4 triples, 2 home runs, 16 RBI and 6 walks. • MLB.com released a new top-20 ranking of Seattle prospects on July 27th and 5 Generals rank in the top-15 of that list. .
• On Sunday, the Generals play game two of a five-game series at Mobile (0-1)…the Generals have won three of the last four series…this is Jackson’s third trip to Mobile and are 3-8 at Mobile this season and 4-12 overall. • 2B Patrick Brady hit a solo home run in the top of the 3rd inning, but it wasn’t enough as the BayBears snapped their 4-game win streak with a 4-1 loss to Mobile on Saturday night. • Brady (1×3, R, HR, RBI), 1B Patrick Kivlehan (1×3, BB), DH Dan Paolini (1×4) and LF Dario Pizzano (1×3) each recorded 1 of the Generals 4 hits. Starter Matt Anderson (1.0,3,2,2,0,0) allowed 2 runs on 3 hits, but left after the first inning. LH Kyle Hunter (2.0,2,0,0,2,0), RH Matt Brazis (2.2,5,1,1,0,1), RH Stephen Shackleford (1.1,2,1,1,0,1,HR) and RH Richard Vargas (1.0,1,0,0,0,0) combined to allow 2 runs over 7.0 innings in relief. • OF Julio Morban was promoted to AAA Tacoma Sunday and OF Jordy Lara was added from A+ High Desert. Lara leaves the California League where he ranks 1st in hits (141), 2nd in batting average (.353), 2nd in RBI’s (80), T-6th in doubles (26), T-3rd in home runs (22), T-3rd in runs scored (77) and 3rd in slugging percentage (.609). • The Generals have scored in the first inning of second innning in 15 of their last 20 games, including a season-high 7 runs in the second inning Friday In total this season, the Generals have scored 56 runs in the first and 65 runs in the second with 27% of total runs scored have occurred in those two frames. • OF Leon Landry went 0-for-4 Saturday and saw his 16-game hit streak end. During the streak he batted .292 (21×72) with 14 runs scored, 3 doubles, 1 home run, 5 RBI, 2 walks and 7 stolen bases. • Summer of Hitting – The Generals are leading the Southern League in batting since June 1st, batting .286 (467/1,634) with 30 home runs, 96 doubles and 23 triples in 48 games. • Extra Extra Bases & Speed – The Generals currently rank 3rd in the league doubles (191) and 2nd in the league in triples (35). They also rank 2nd in the league with 98 stolen bases. • 3B D.J. Peterson has reached base safely in 17of his last 18 games (hits in 14 G) with 8 multi-hit contests, batting .333 (23×69) with 14 runs scored, 4 doubles, 5 home runs, 8 walks and 1 stolen base. Peterson has recorded at least 1 hit in 21 of 26 games with Jackson, while reaching base safely via a walk or hit in 24 games. Overall with Jackson he is batting .297 (30×101) with 15 runs scored, 6 doubles, 5 home runs, 16 RBI, 10 walks and 1 stolen base. Peterson leads all Mariners farmhands with 23 home runs. • INF Patrick Kivlehan currently has a 10-game hit streak, batting .400 (16×40) with 7 runs scored, 5 doubles, 3 triples, 1 home run, 10 RBI and 4 walks. He also has hit safely in 15 of his last 16 games, batting .400 (24×60) with 13 runs scored, 6 doubles, 4 triples, 2 home runs, 15 RBI and 6 walks. 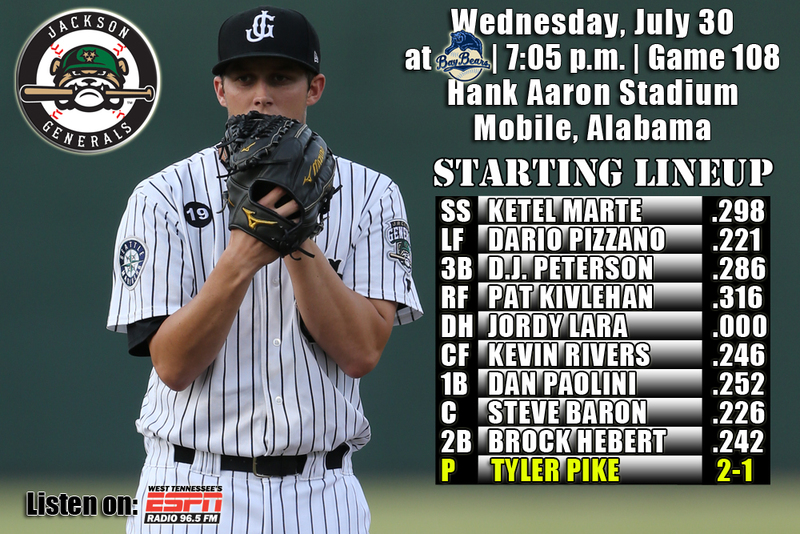 • The Generals carry a four-game winning streak into tonight’s game one of a five-game series at Mobile…the Generals have won three of the last four series’…this is Jackson’s third trip to Mobile and are 3-7 at Mobile this season and 4-11 overall. • The Generald scored 1 run in the 1st inning and 7 in the 2nd inning as the Generals won their 4th straight game with an 8-3 win over Huntsville on Friday night. • SS Ketel Marte (3×5, 2 R, 2B, 2 RBI) led the team with 3 hits and drove in 2 runs, while 1B Daniel Paolini (2×4, R, RBI) rcorded the only other multi-hit game. DH Dario Pizzano (1×3, R, 2B, 2 RBI, BB), CF Leon Landry (1×4, R, RBI, BB), 3B D.J. Peterson (1×4, R, 2B, RBI, BB) and RF Patrick Brady (1×4, 2B, RBI) combined to drive in 4 of the team’s 8 runs. • Starter Tyler Pike (3.0,6,3,3,0,3) allowed 3 runs on 6 hits in 3.0 innings, but did not factor into the decision. LH Cam Hobson (4.0,2,0,0,1,5) allowed 2 hits and struck out 5 in 4.0 shutout innings to earn his 6th win, while RH David Colvin (2.0,1,0,0,0,2) held the Stars scoreless over the final 2.0 innings to secure the victory. • Prior to Friday’s 4th straight win over Huntsville, Jackson’s longest winning streak was 3 games (4/28-5/1, 6/1-6/3 and 7/11-7/13).. It was the first 4-game win streak and first time taking 4 of 5 in a series. • The Generals have scored in the first inning of second innning in 15 of their last 19 games, including a season-high 7 runs in the second inning Friday In total this season, the Generals have scored 56 runs in the first and 65 runs in the second with 28% of total runs scored have occurred in those two frames. • OF Leon Landry currently has a 16-game hit streak, batting .292 (21×72) with 14 runs scored, 3 doubles, 1 home run, 5 RBI, 2 walks and 7 stolen bases. It is currently the longest in the Southern League. • Summer of Hitting – The Generals are leading the Southern League in batting since June 1st, batting .289 (463/1,604) with 30 home runs, 96 doubles and 23 triples in 48 games. • Extra Extra Bases & Speed – The Generals currently rank 2nd in the league doubles (191) and 2nd in the league in triples (35). They also rank 2nd in the league with 97 stolen bases. • SS Ketel Marte has hit safely in 12 of his last 14 game with 7 multi-hit efforts, batting .344 (22×64) with 12 runs scored, 4 doubles, 2 triples, 1 home run, 9 RBI, 2 walks and 5 stolen bases. • 3B D.J. Peterson has reached base safely in each of his last 17 games (hits in 14 G) with 8 multi-hit contests, batting .338 (23×68) with 14 runs scored, 4 doubles, 5 home runs, 8 walks and 1 stolen base. Peterson has recorded at least 1 hit in 21 of 25 games with Jackson, while reaching base safely via a walk or hit in 24 games. Overall with Jackson he is batting .300 (30×100) with 15 runs scored, 6 doubles, 5 home runs, 16 RBI, 10 walks and 1 stolen base. Peterson leads all Mariners farmhands with 23 home runs. • INF Patrick Kivlehan currently has an 9-game hit streak, batting .405 (15×37) with 7 runs scored, 5 doubles, 3 triples, 1 home run, 10 RBI and 3 walk. He also has hit safely in 14 of his last 15 games, batting .404 (23×57) with 13 runs scored, 6 doubles, 4 triples, 2 home runs, 15 RBI and 5 walks. • RHP Matt Brazis recorded his first Jackson save Thursday night against Huntsville. In his first 5 Double-A outings he has allowed just 1 run in 10.2 IP (0.84 ERA), walking just 2 and striking out 10. In total, Brazis is 4-0, with a 2.52 ERA in 28 games, posting 60 strikeouts and just 10 walks. 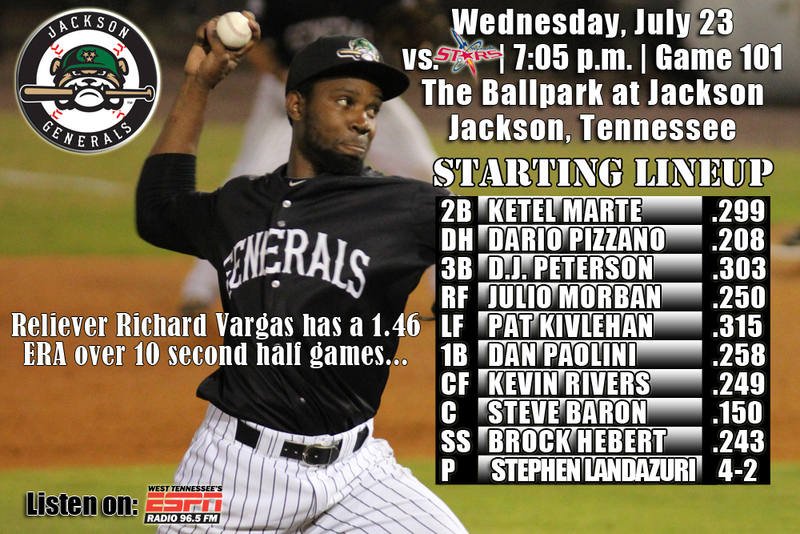 • The Generals look for their 4th straight win for the first time this season in game 5 of a series at The Ballpark in Jackson against the Huntsville Stars (3-1)…Jackson is 10-9 against Huntsville this season and 6-3 in Jackson…,the Generals have won 3 of last 4 series and 7 of last 10 games overall. • SS Brock Hebert (1×3, RBI) broke a 2-2 tie with a two-out RBI single in the sixth inning last night giving Jackson a 3-2 victory that clinched a third straight win and the series against Huntsville. • C Mike Dowd (2×3, R) collected Jackson’s only multi-hit game as CF Leon Landry (1×4) extended his hitting streak to 15 games and LF Pat Kivlehan (1×4, 2B, R) upped his to 8 games. • Starter Victor Sanchez (4.0,5,2,2,1,4) took a no decision while reliever Trevor Miller (2.2,2,0,0,1,4) picked up his first win since 5/29. Kyle Hunter (1.1,1,0,0,1,2) added a hold and Matt Brazis (1.0,0,0,0,1,1) earned his first Jackson save. • The Generals have scored in the first inning of second innning in 14 of their last 18 games. In total this season the Generals have scored 56 runs in the first and 58 runs in the second and 26% of total runs scored have occurred in those two frames. • Chris Taylor made his Major League debut last night for Seattle, starting at shortstop and batting ninth. • Recorded first hit in bottom 5th inning (single to center off Wei-Yin Chen). • Taylor is the 151st Jackson player to make his MLB debut and is the 8th from the 2013 roster. He joins OF Abraham Almonte, C Brandon Bantz, OF James Jones, SS Brad Miller, LHP Roenis Elias, RHP Dominic Leone and RHP Taijuan Walker. • OF Leon Landry currently has a 15-game hit streak, batting .294 (20×68) with 13 runs scored, 3 doubles, 1 home run, 4 RBI 1 walk and 7 stolen bases. It is currently the longest in the Southern League. • The Generals look for their 3rd straight win in game 4 of a 5-game series at The Ballpark in Jackson against the Huntsville Stars (2-1)…Jackson is 9-9 against Huntsville this season and 5-3 in Jackson…,will play the Stars 7 more times during the final 38 games of the regular season. • 3B D.J. Peterson hit his 5th home run with the Generals as Jackson defeated Huntsville 8-3 on Wednesday night. • Peterson hit a 2-run home run as part of a 3-run 6th inning that gave Jackson a 4-2 lead. DH Dario Pizzano (3×4, R) led the Generals with 3 hits, while Peterson (2×4, R, HR, 2 RBI), RF Julio Morban (2×3, R, RBI) and LF Patrick Kivlehan (2×4, 2 R, 2B, 3B, RBI) each recorded 2 of the team’s 12 hits. • Starter Stephen Landazuri (7.0,5,2,2,2,8) earned his 5th win, allowing 2 runs on 5 hits and striking out 8 in 7.0 innings. RH Richard Vargas (1.0,2,1,1,0,1,HR) allowed a solo home run in the 8th inning, while RH Mayckol Guaipe (1.0,0,0,0,0,3) struck out all 3 batters faced in the 3 innings. • The Generals have scored in the first inning in all 3 games of this current series with Huntsville. 2 on Monday, 4 on Tuesday and 1 last night. Jackson has scored in the first inning in 4 of 6 games entering Thursday. 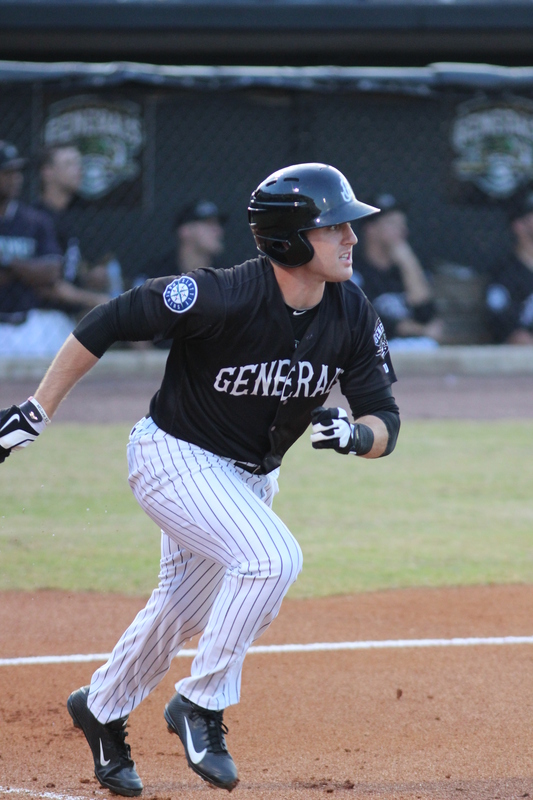 The Generals have score 56 runs in the first and 57 runs in the second this season, resulting in 26% of Jackson’s 2014 runs. • OF Leon Landry currently has a 14-game hit streak, batting .297 (19×64) with 13 runs scored, 3 doubles, 1 home run, 4 RBI 1 walk and 7 stolen bases. It is currently the longest in the Southern League. • Summer of Hitting – The Generals are leading the Southern League in batting since June 1st, batting .288 (444/1,539) with 30 home runs, 91 doubles and 23 triples. .
• Extra Extra Bases & Speed – The Generals currently rank 2nd in the league doubles (186) and 2nd in the league in triples (35). They also rank 2nd in the league with 97 stolen bases. • In addition to his 14-game hitting streak, OF Leon Landry has hit safely in 21 of his last 22 games, batting .303 (30×99) with 16 runs scored, 3 doubles, 1 triple, 1 home run 6 RBI and 9 stolen bases. Since June 7, Landry has hit safely in 33 of his last 36 games with 16 multi-hit efforts, batting .336 (50×149) with 24 runs scored, 6 doubles, 3 triples, 1 home run, 8RBI, 3 walks and 15 stolen bases. During this 30 game stretch he has raised his season average from .236 to .283. • SS Ketel Marte has hit safely in 11 of his last 13 game with 6 multi-hit efforts, batting .322 (19×59) with 10 runs scored, 3 doubles, 2 triples, 1 home run, 7 RBI, 2 walks and 5 stolen bases. • 3B D.J. Peterson has hit safely in 13 of his last 15 games with 8 multi-hit contests, batting .361 (22×61) with 13 runs scored, 3 doubles, 5 home runs, 6 walks and 1 stolen base. Peterson has recorded at least 1 hit in 20 of 23 games with Jackson, batting .312 (29×93) with 14 runs scored, 5 doubles, 5 home runs, 15 RBI, 8 walks and 1 stolen base. Peterson leads all Mariners farmhands with 23 home runs. • INF Patrick Kivlehan currently has a 7-game hit streak, batting .433 (13×30) with 6 runs scored, 4 doubles, 3 triples, 1 home run, 10 RBI and 1 walk. He has hit safely in 12 of his last 13 games, batting .420 (21×50) with 12 runs scored, 5 doubles, 4 triples, 2 home runs, 15 RBI and 3 walks. is 4th in AVG (.322) and Kivlehan is 9th (.305). 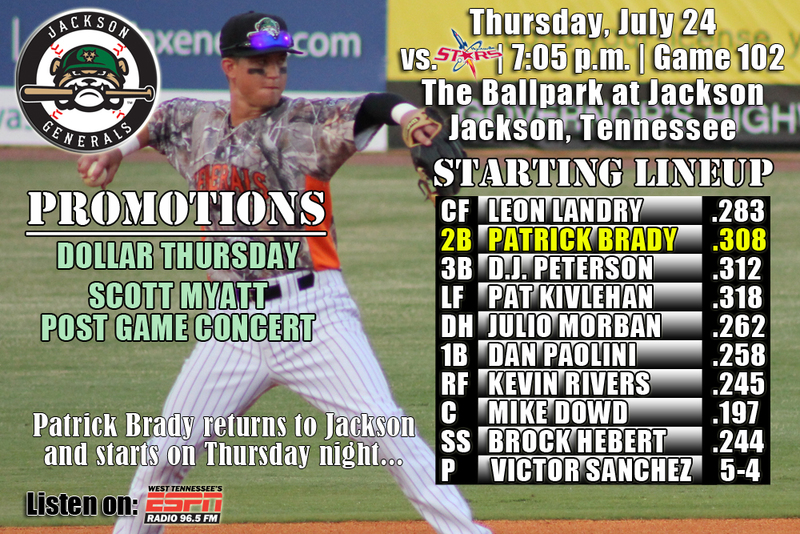 • The Generals continue a 5-game series at The Ballpark in Jackson tonight against the Huntsville Stars…Jackson is 8-9 against Huntsville this season and 4-3 in Jackson…,will play the Stars 8 more times during the final 39 games of the regular season. • The Generals scored 5 runs over the first 2 innings and held on for a 5-2 win on Tuesday night. • SS Ketel Marte (2×4, R, 2B, 2 SB), 1B Patrick Kivlehan (2×4, R, 3B, RBI) and LF Kevin Rivers (2×4, 2 2B) each recorded 2 of the Generals 9 hits. • Starter Tyler Olson (6.0,8,2,2,3,1,HR) picked up his 5th win with Jackson, allowing 2 runs on 8 hits in 6.0 innings. RH David Colvin (2.0,2,0,0,0,1) and RH Mayckol Guaipe (1.0,1,0,0,0,2) combined to hold the Stars scoreless over the final 3.0 innings. Guiape earned his 7th save of the season, allowing only 1 hit and striking out 2 in the 9th inning. • INF Ketel Marte recorded his 32nd multi-hit game on Tuesday and he currently ranks 9th in the league in batting (.299), 1st in hits (115), 5th in triples (6), T-4th in stolen bases (22). • Marte has posted 5 hitting streaks this season of 7 or more this season. • July by the numbers – After batting .294 as a team in June, the Generals are currently batting a league-best .278 in July. The 17 July home runs ranks T-3rd in the league and 10 wins is T-3rd. • Extra Extra Bases & Speed – The Generals currently ranks 3rd in the league doubles (184) and 2nd in the league in triples (35). They also rank 2nd in the league with 97 stolen bases. • SS Ketel Marte has hit safely in 11 of his last 12 game with 6 multi-hit efforts, batting .345 (19×55) with 9 runs scored, 3 doubles, 2 triples, 1 home run, 7 RBI, 1 walk and 5 stolen bases. • 3B D.J. Peterson has hit safely in 12 of his last 14 games with 7 multi-hit contests, batting .351 (20×57) with 12 runs scored, 3 doubles, 4 home runs, 6 walks and 1 stolen base. Peterson has recorded at least 1 hit in 19 of 22 games with Jackson, batting .303 (27×89) with 13 runs scored, 5 doubles, 4 home runs, 13 RBI, 8 walks and 1 stolen base. • INF Patrick Kivlehan currently has a 6-game hit streak, batting .423 (11×26) with 4 runs scored, 3 doubles, 2 triples, 1 home run, 9 RBI and 1 walk. He has hit safely in 11 of his last 12 games, batting .413 (19×46) with 10 runs scored, 4 doubles, 3 triples, 2 home runs, 14 RBI and 3 walks. is 5th in AVG (.320) and Kivlehan is 10th (.303). 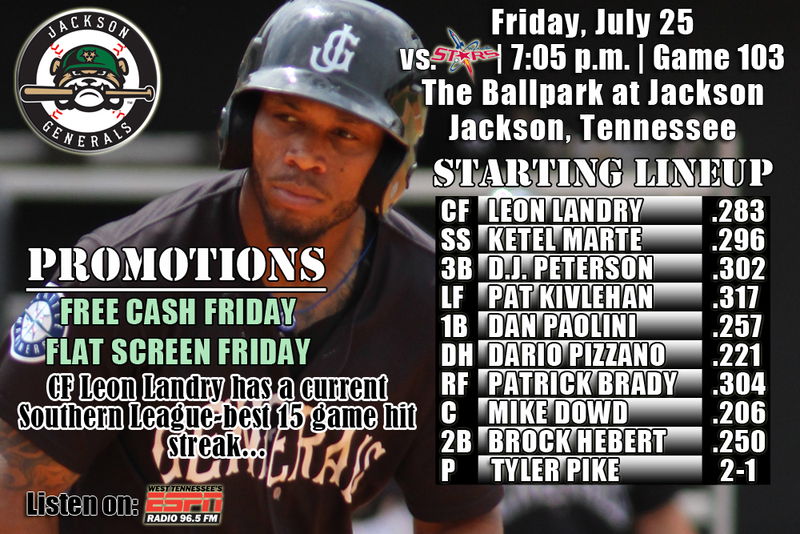 • The Generals continue a five-game series at The Ballpark in Jackson tonight against the Huntsville Stars (0-1)…Jackson is 7-9 against Huntsivlle this season and 4-2 in Jackson…will play the Stars 9 more times during the final 40 games of the regular season. The Geneals have dropped 12 of their last 17 home games dating back to 6/14. • The Stars cored 5 runs on 10 hits Monday and four of those runs and 9 of the hits came with 2 outs in a 5-2 win over the Generals Monday. The loss was Jackson’s 3rd straight. • Jackson took a 2-1 lead after the first inning on an RBI double by Patrick Kivlehan (1×4), his 15th on the season. Julio Morban (0x4) added an RBI groundout to give Jackson the lead. • Huntsville scored a run in the 5th and 2 more in the 7th to take a 5-2 lead. • Starter Matt Anderson (6.0,4,2,2,1,2) notched his 5th quality start, but it was in a no decision. LH Cam Hobson (1.2,4,3,3,2,2) suffered the loss. • Brock Hebert (2×3) had Jackson’s only multi-hit game recording his 3rd straight 2-hit game. • D.J. Peterson and Patrick Kivlehan rank 1st and 2nd in the Mariners Minor League system in RBI’s with 84 and 81 respectively. Peterson is first in homers (22) while Kivlehan ranks 5th (16). Peterson is 4th in AVG (.323) and Kivlehan is 10th (.301). • INF Ketel Marte recorded his 30th multi-hit game on Sunday and he currently has a 5-game hit streak. He ranks first in the league in at-bats (380), 11th in the league in batting (.298), 1st in hits (113), 5th in triples (6) and 5th in stolen bases (21). • INF Patrick Kivlehan now has enough Double-A at-bats to qualify for the league leaders and his .312 batting average currently ranks 5th in the league. 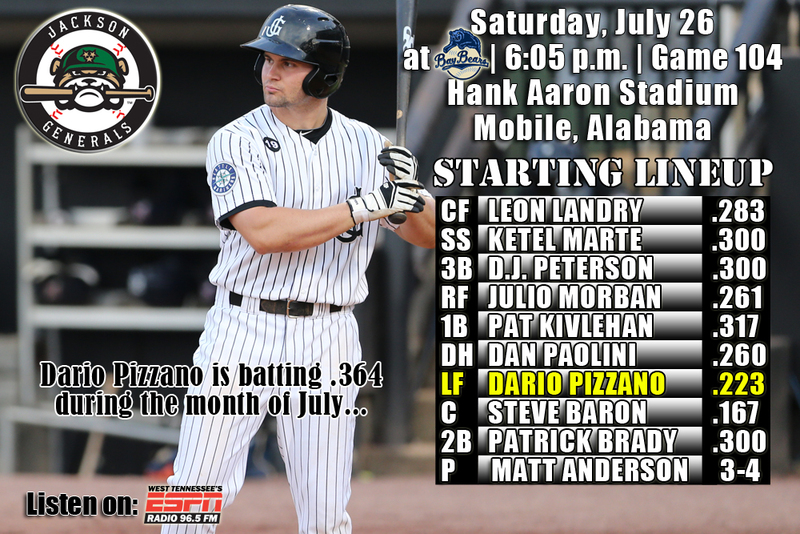 • In 16 July games so far OF Dario Pizzano is batting .340 (16×47) with 10 runs, 4 doubles, 4 triples, 2 home runs, 13 RBI, 11 walks and posted a .467 on-base percentage. His July OPS is 1.190..
• July by the numbers – After batting .294 as a team in June, the Generals are currently batting a league-best .276 in July. The 17 July home runs ranks T-2nd in the league and 9 wins is T-4th. • Extra Extra Bases & Speed – The Generals currently rank T-2nd in the league doubles (181) and 2nd in the league in triples (35). They also rank 2nd in the league with 94 stolen bases. • INF Brock Hebert has recorded 3 straight 2-hit games and is batting .600 (6×10) with 3 runs in his last 3 games. • SS Ketel Marte has hit safely in 5 straight games batting .304 (7×23) with 6 runs, 1 double, 1 triple, 1 home run and 3 RBI. • OF Leon Landry has hit safely in 20 of his last 21 games, batting .305 (29×95) with 15 runs scored, 3 doubles, 1 triple, 1 home run 6 RBI and 7 stolen bases. Since June 7, Landry has hit safely in 32 of his last 35 games with 16 multi-hit efforts, batting .338 (49×145) with 23 runs scored, 6 doubles, 3 triples, 1 home run, 8RBI, 3 walks and 14 stolen bases. During this 30 game stretch he has raised his season average from .236 to .284. • 3B D.J. Peterson has hit safely in 18 of 21 games with Jackson, batting .302 (26×85) with 12 runs scored, 4 doubles, 4 home runs, 8 RBI and 7 walks. Peterson cufrently leads all the Mariners Minors with 23 home runs this season.